CLICK SPOILER FOR STRAT ALSO LOOK AT THE MAP TO KNOW THE REASON FOR THE STRAT. Objective: To defensively guard bombsite A rushings. 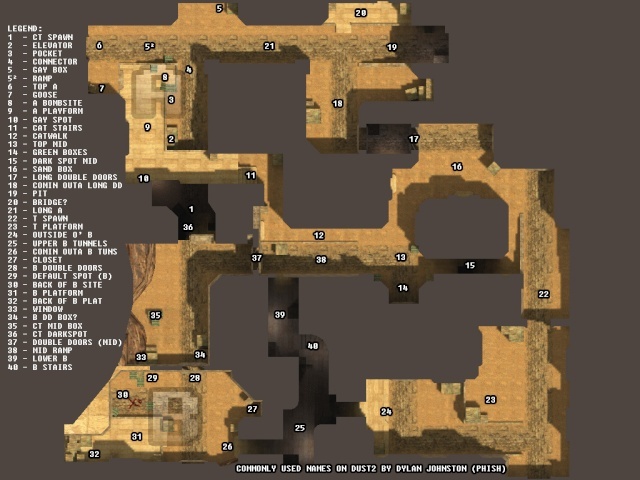 Preparation: 4 Rush from spawn to Bomb A platform and get in position for the rush & 1 rush B with RIFLE all the way to T spawn and hold. ( Strat caller design the team for preparation. ) 1 Awper allowed for Goose and StackBox. Tactic+WhatToListenFor: *1. If Goose calls Multiple on Long A, 1 guy from StackBox will fall back onto the platform over CT spawn and defend it, while 1 StackBox and B Rush watch lower B for stragglers. *2. If StackBox call multiple on Cat or Mid, Goose will hold their position and Stack Box slowly fall back to platform over CT spawn making some noise and defending Bomb A While B rush Rush really fast to cat from their position at T spawn to cat and taking out the team. *3. If B rush calls multiple outside or in tunnel, StackBox will slowly rush in lower B helping B rusher while Goose rotate real fast to Bomb B by double door and helping B rusher also. *4. If there is a spread out situation where the enemy is going different direction and picking on us, Goose will remain in place and 1 StackBox with rifle will go into lower b into stairs covering B rusher. B rusher will hold position in B tunnel for any enemy going B.